The hamlet of Porquis Junction is about 10 minutes from Iroquois Falls. Porquis Junction used to be a small agricultural centre, with its own agricultural hall and even a John Deere dealership (Jensen’s Sales and Service) which serviced farms from Iroquois Falls to Matheson up until the early 1990s. As far as I can tell, it is not pronounced Por-kee but Pork-wiss, which to me sounds like a brand of tinned ham. The town should nominate someone as the official ‘Marquis of Porquis’ every year at the end of the Blues Fest or Ag Festival. Why? Because it just sounds cool. Porquis must be the festival capital of the north as it hosts a number of different celebrations despite its relatively small size. 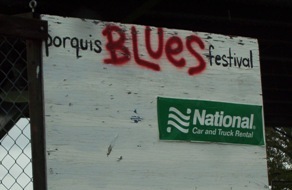 Known across the north, the Porquis Blues Festival is held on a small covered stage behind the community centre every July. The town also hosts an Agricultural Fall Fair in August. In 1986, the town made the news when the Porquis Fun Days festival attracted world-famous wrestler André the Giant, who then proceeded to eat the hamlet out of house and home. Porquis is about 10 minutes off Highway 11, on the way to Iroquois Falls. This was the second time, after Opasatika, that I had been chased by a dog while taking pictures – I guess he was bored. Or just very protective of the Porquis Junction Agricultural Hall. This entry was posted in The Interior and tagged farm town, festivals by Highway11.ca Editor. Bookmark the permalink. I am doing a family history. My grandfather Harry Sefton was prospecting around Iroquois Falls (where my father Larry was born in 1917) and Porquis Junction in 1916. I have little information but one of his letters mentions a huge fire over a large area at that time. He and his wife Mary had a house in Porquis which was not burned down but was filthy and full of smoke and some houses did burn down in the townsite and beyond. Just wondered if anyone knew more about this incident or about Harry. 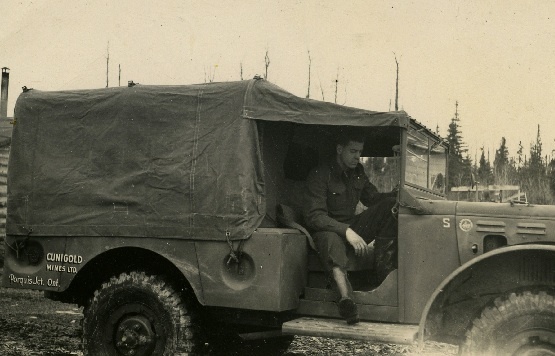 not only sacrificed his life but the Northern Star shines brighter on Northern Ontario. I know the Dutch will never forget you for their freedom. If anyone has information on the Porquis Junction station please contact me. The Barr’s used to live on Wings Rd, near the Iroquois Falls airport. Lorraine and Bruce had been at the Manor in town for some time, but I have not been in touch with them for around 10 years. Actually, that was Lorraine and Bobby Barr at the Manor. Lorraine and William (Bill) Barr were my Grandparents that lived across from the Airport. Their son Robert (Bobby) Barr was my Uncle. They have all passed away… if you wish to communicate further please feel free to email me with the name BARR family info in the subject please. Joseph Tremblay was my father. Just came across this site. So many memories. Mrs Glembus and Mrs Vickers were my favourite teachers. Made school fun. The Canada House. ONR train would stop at Wings Crossing to let me off and I’d cross highway 11 and be home. Great service. Always met someone I knew on the train fro Toronto to Porquis Jct. Such a shame that the school was closed and we were bused into Ansonville or was it Iroquois Falls A by then. My grandmother Leda Besaw was so upset when she got a private phone line. She loved to listen in on the party line calls with her friend Mrs mcquoid. Some one that would be Brenda McQuoid told me about a school reunion. Got to attend that. My maiden name was Dennis and I lived across the tracks at Wings Rd and baby sat all you guys at one time or another. I agree the Mrs. Glembus was an awsome teacher at Porquis school. It was a rough school at times, but what we survive makes us strong. It is nice to hear you are still kicking around. I was wondering if anyone knew of Elizabeth ,Eugene ,& Philip Marquis . They were born Riverside ,Manitoba & raised inCochrane, Ontario. Elizabeth married a John Ernest Moore she lived most of her life in Northeren Ontario.She was secretary to the school board in Canfield, Moose River, she died October.19 2001 she was 78 years old.Elizabeth & her brothers were my Dads cousins, who was English.their Mother was from England , she was my Dads Aunt,her name was Margaret Elizabeth Buller . 1889 .Her husbands name wasCharles Edward Marquis. In the 50s they use to send us a food package near Christmas. If anyone has the least bit of information I’d be truly greatful. Gloria. Moose River/Cochrane – Reply to Gloria’s post from July 17, 2015. Elizabeth and Ernie Moore were my parents. You must be my 3rd cousin. I was named after your Dad’s aunt, my grandmother. I’ve just come across this posting by happenstance. I was not aware I had relatives on my mothers side in Northern Ontario…but then again you could be posting from afar. The blog does not indicate the location of the reply. To Margaret, THANKYOU for answering my inquiry, I am so happy you answered. I had written it last Summer, never expecting an answer, I too just happen to look up your uncles names and saw your reply. Gloria. The location of Porquis Junction from Highway 11, is nowhere near as far as you say it is. The Agricultural Hall in the photo you have posted, is right beside the railway there, & just feet from a stop sign on the right hand side, in this photo to. After you turn left at the stop sign, you’re just a few seconds drive from the railway crossing there; & that’s only another few seconds drive again from another stop sign. And in front of you at that stop sign, is Highway 11. If you were to turn right, it would bring you straight to Cochrane, Ontario (birthplace of “Miles Gilbert Horton” aka “Tim Horton” founder of the coffee shop chain). If you were to turn left at that stop sign, it will bring you straight through to anywhere in Ontario. There’s a turn not too far away that will bring you to Timmins, Monteith, Matheson, etc…. So, yes. Highway 11, is just feet away from the Agricultural Hall in Porquis Junction. I know this because, I was born in Iroquis Falls, raised in Monteith & was always visiting Porquis Junction where my Dad grew up. Dad’s sister, nephew, maternal Grandmother, amongst many other relatives of mine, once lived there. SInce, Dad worked for the ONR for nearly 31 years; he most certainly has always been a book of knowledge re: anything & everything that has to do with ONR, right from the very beginning. You may want to take a trip here & see for yourself, just how close Porquis Junction is to Highway 11. If you do, you’ll see for yourself that it’s a blink of an eye from the Highway. Across the street from that stop sign on Highway 11 there, is the road that takes you to “Porquis Cemetary”, where many of my relatives are at rest. One more thing….. Don’t bother using Mapquest.ca or even Google Maps, as a reference for Porquis Junction or even Monteith because, they have no clue! where anything is! They’re directions, street addresses, etc…. are almost 100% inaccurate! They’re way off! Believe me! You’d be better off using an Ontario Map or asking the Thelma Miles Museum in Matheson for any local maps that they have. Hope this helps. Good luck with everything. You shure are messed up on the locations of Iroquois falls and porquis. My great grandfather settled in PQ and had a farm there. He got burned out a few times and built a roadhouse which also burned. His name was Berger and the family cemetery is still there. My grandmother was interred there in 2013 as was my uncle Don and my Brother Larry. Dont know much about my great grandparents but would love to know more. He was involved in stating the first school house in the area. Hope to hear more about him. This is just a shot in the dark but I’m trying to track down what I can about my Great Grandfather who lived in the area. His name was Frank Seaton and he was a farmer residing in McCart township. He was sadly killed by a team of runaway horses. I’ve just received a copy of the newspaper article out of the Porcupine Advance from September 27, 1928. It says he was killed on “Wilson Lake road 3 miles from Porquis Junction. He had been loading pulpwood at Brown’s Siding with his son Ross, a man named Jim Singh and another boy Alex Woodrow. A telegraph operator Howard Bolt discovered him and later Magistrate Tucker from Cochrane pronounced him dead at the scene. If anyone can add anything it would be greatly appreciated. I’m not familiar with the area but if anyone can point out where this would have most likely occurred and where Browns Siding is located it would be greatly appreciated. Any former relatives or friends of anyone mentioned in the article would also be interesting to hear from. Thanks. it was near Iroquois Falls airport. Porquis Junction is not listed anymore since Iroquois Falls annexed it. It is shown on map south of Airport near where Hwy 67 intersects. Good Luck. It’s the Porquis airport NOT iroquois falls and we’ve NEVER been annexed by anyone! I hrew up here my whole lige as did my mom and uncle before me and my grandpa was one of the first to settle here as Cosens riad is named after him…. I very much dislike how people think they know what thwy’re talking about in refference to Porquis when really they have no clue!! Sorry to have hit a bad note with you. I lived across the road from the airport for 17 years. It was called various names and maybe I’m just confused about what people knew it as at different times. Hope you find what you are in need of. I just looked on Google maps and the sign on the road shows an image of a plane and the words Iroquois Falls written below that. Maybe it is called that now. I don’t know for sure. My family tree includes the Barrs, Rattu, Grangers, Neil & Princes from Iroquois Falls. Feel free to contact me if you want to compare trees. Bill Barr was my Grandpa. email ganny2006@live ca with Barr Family Tree in the subject. I have seen MacDonald’s in the historical records of Porquis Junction. Are you related to the family or just found the record? I have been researching the area for years because my ancestors settled the area in 1910. Porquis is in the Cochrane District in Northern Ontario off Hwy 11. It is now part of Iroquois Falls but the people of the area still refer to the small junctions as Porquis. It was once the end of the rail line but then became a junction with a branch line into Iroquois Falls and one onward to Cochrane. Hope this helps. Hi I would be most grateful for any info that I can get about my wifes Great Aunt Mary Elizabeth Cousins who lived in the Porquis Junction area in 1958. She was married to John Healey Cousins. who was living in the Porquis Junction area of Ontario in the 1958. She was married to John Healey Cousins and is my wifes Great Aunt. I would be most grateful for any information that I could get on her life in the Porquis Junction area during her stay there. Hi Anthony. I just thought I’d let you know that, there’s only 1 “Cosens” listed here in our local 2015 phonebook for our area here. The name is, “Claudette Cosens”; who’s late husband was “Bob Cosens”. She’s the nicest lady in the world here, and I’m sure that if you were to call her at home; that she’d be more than happy to help you out any way that she can. Her phone number is: 1-705-232-5397. Good luck & hope this helps you out some. Take care. I am born and raised right here in Porquis Jct. Most of the names I see above I recognize or know. 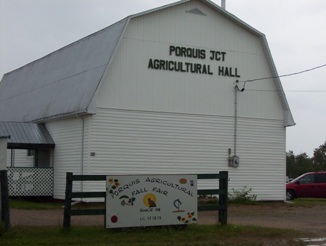 I am still involved with the Porquis Agricultural Society and we are hosting or 95th annual Fall Fair this year – 2013. For our 100th in five years – 2018 we are hoping to write a book on Porquis centering around the fall fair and all of the other events that have happened throughout the years. We would be grateful to hear from you with stories and pictures and if you could pass this along to others you may know that would be great. When my family moved from out west to Kelso/Porquis Junction in 1953, we lived with Oscar Frank and his family before moving into Porquis. The youngest child, Elaine, was about my age and we were friends. Just wondering if you are related? Thank you very much for replying to my inquiry to Betty!! My brother Paul and I were talking about living on the Frank farm and in Porquis Junction just a few weeks ago. Fond memories. Please remember me to Betty, Elaine or Bobby if you should see them. Oscar was my uncle, Walter was my father. Bob & Elaine are my cousins. I can remembering going to their place when you were there. We all had a meal together and I think I have a picture. I will remember you to Elaine when I see her. How is your collection going for 100th anniversary in 2018? My father was Cecil Rattu and my mother is Alice. I’ve heard her talk about your family many times. We are in the process of writing a book about Porquis Agricultural Society and the town of Porquis Jct. Any information you would have would be most appreciated and also pictures. I do remember your family and I think I went to school here in Porquis with your brother Harvey. We are planning a number of events for next year. The launching of our book at our Annual Meeting in January 2018, also a Cook Book at our Easter Tea I believe in April, perhaps something in June(still in the planning stage), our Annual Fall Fair August(weekend before Labour Day) where we will make a commemoration to a local resident, an antique and picture display in September as well as 100th Anniversary banquet. All is still in the planning but this is what we are striving for. We also hope that some of the former residents will return for some of the events. Hi Ron and Betty. Idk how I came across sight but went thru some posts. Ron Betty would know or know of our family. I stayed with grandpa and grandma all the . I can remember who once lived around that block. Starting with the big White House was Germaine’s. Then cashmore cooper grandma and grandpa Laura and Roy ouellette. Miss moles. Ur grandparents my grannie and grandpa Robert and Gertie rattu. Mike and Mary prokopet ed Neil and mime don’t remember who was beside them but it was a senior couple. Then yacky I don’t remember the next house being post office but was told it was and gambles had it. Fedesko then later Ruth and Ron quevillon sopchyshyn cousins Fred russel then it would be back to Germaine. Across from Germaine’s was manzuke and was told it was once a grocery store also that they ran. Across street from grandpa ouellette ur parents. House down long time ago. Manzuke house down also Ralph Burbany had store across from hotel. Across from mike and Mary was mcmann but I remember more ken white and his family there. They also had post office there closer to high way was Kate seaton. Her grandson now there Aaron. And there was Ralph shirks. Ritter was known as dog collector. He lived across tracks need space for all the dogs. I remember Betty lol peevers mcquids also Sammy and Corrine McGrath Robinson’s. Joe and Helen had the hotel. That would be Linda’s uncle Barry’s wife parents. Mr. & Mrs. Glembus were the best ever teachers at Porquis Public. I can remember waiting for the bus and looking for 4 leaf clover in the lawn out front! Hi. A distant cousin of mine died Sept. 2, 1972 and his funeral was in Porquis Junction on Sept. 6, 1972. His name was Golden ‘Goldie’ Delbert Brown. He was murdered in his home near Radley’s Hill, in New Liskeard. I have been able to find the obituary for one of his children. This gave me the names of all of his children and his wife Winnifred (nee Watt). Would anyone remember him or any of his family. Are you still looking for this information, and if so, are you putting together a family tree? I was born in Porquis and my mother remembers Goldie and Wnnie. She said that they had a little girl that died in a fire. We moved away from there in 1965 after my father was killed in an accident at work. Her sister Elisa Germain is on facebook. Elisa lives in North Bay. Melissa is in Timmins or South Porcupine. Kim ?! Is that REALLY You ?!!!!!!!! Hi Ken Frost this is Fay Hilts Sheldy’s younger sister I do remember you and I believe you had a sister. Sheldy has been dead three years this May. He had heart disease and many surgeries, quite a character and we all miss him so much. I was born and raised in Ansonville, now Iroquois Falls. You mentioned your dad was the airport manager in Porquis. The airport call letters were QJ, I believe, back then. I took my very first plane ride in 1955 out of Porquis on a TCA DC-3. I will never forget it. I remember the pilots on the TCA flights wandering around the immediate area of the airport terminal filling their pilot uniform hats with blue berries before departing again for North Bay and Toronto. I have an old photograph of that airport site with a shiny TCA DC-3 parked beside the terminal building. I was crazy about the weather back then (I was about 9 years old) and was always fascinated by the spinning anemometer cups on top of the terminal. I did become a meteorologist and worked for the Canadian weather service until I retired. I go back to Iroquois Falls every summer to see a few remaining family members there. I really look forward to that annual journey and I always drive slowly when passing the old airport. You also mentioned Ms Witmell as one of your teachers. I remember when she came to the Ansonville Public School one year as a student teacher and taught us for a week. The next year she signed on as a teacher in Porquis. Great memories. A great place to grow up. Do you remember another staffer at the Porquis airport by the name of Hamilton? I believe his first name was Jimmy. He was a great friend of my dad. Edith,hi, check for Hempen Heritage on FB, that be me. Would you like Randy’s mailing address, he lives in Sudbury now. Does anyone remember that plant explosion in Porquis? I forget what caused it and what kind of plant it was. I was in highschool therefore between 1991-1995. What a surprise to find this site. I was born in Porquis,in 1929. my Dad worked on the T&NO…Cam (Slim) Hudson was his name. Went back to a school reunion a few years back. My g-parents were Tom and Annie McGrath ….Tom was custodian at the school when I attended. We lived in a Section House and have fond memories of being a child living beside the tracks. Moved to Cochrane when I was about l0 and then on to the Ottawa Valley. My brother Elmer still lives in Sault Ste Marie. Would love to know if anyone remembers the Steeles, he was the Section Foreman back in the early 30\’s….Would like to once again contact Anne, who would be about my age too. Hello!. I am looking for information regarding my grandfather, William McGrath, “Bill” who was born in Porquis Junction on September 10, 1913. I believe he had lots of siblings, but never met or knew the names of any of them. He ended up in Toronto where he married my grandmother Dorothy Cooper. Any ideas? Many of the McGrath’s are buried in the Porquis Cemetery. The cemetery is available on-line through the Northern Ontario Cemetery Funding aid or grave markers…. My parents were very good friends with Sam & Corine McGrath who have both passed away. I spent most of my childhood in PJ, almost every weekend it seems.My father grew up there but moved to Timmins, so we would go visit Nanny. Even though I’m in my 40′s, it brings tears to my eyes when I think back to how wonderful life was in that little piece of heaven called Porquis Junction. I believe the Sopchyns are buried in the Goldlands Cemetery . Was Mrs Moles your Nanny? I love P-town with all my being and soul!! I miss growing up there so much! My mom has lived there her whole entire life and I want to return soon too….if anyone wants to leave or sell their house let me know, i’d come back to the simplicity of life. We NEVER had reason to say we were bored, despite the size of the town we always had something to do. My uncle worked at the station, my g-pa lived there for as long as i can remember and my mom and her brother are still there….and i’m sure i can still name every street, tell you were every house is and who lived/lives there. If you are still interested in property in Porquis send me an e-mail as I know of one. I am the director of the Pioneer Museum in Iroquois Falls and have enjoyed your comments on Porquis. By Christmas of 2010 we will have for sale ($29.95) a history book of Iroquois Falls and surrounding areas including Porquis.Our number is 705-258-3730- order now as we have a limited number of copies. What is the name of this book? Is a copy also available at our local libraries? Hi : I am a new observer of your page. Did you know that Porquis handled all the long distance phone calls from Timmins until 1950. I maintained eqipment here from 1951 to 1957 which was used on the telephone and telegraph lines. A comment on your Monteith story I believe it would be more useful to use the Temiskaming and Northern Ontario Railway than old ONR. The name was changed in 1946. Keep up the good work , I have a vast collection of the area from Matheson to Moosonee which I call the Abitibi frontier. Hi Lori. I was so shocked when I saw your name on the visitors comments. Can I find you on Facebook? Is your name Tremblay still or again? I’m back to Cornell and you can find me on Facebook. I’m going to send Sharon a message tonight and let her know that you are looking for her to catch up with things. Hi Edith, you can email me and I can give you some info on how Randy is, and you can tell me about how Sharon is perhaps? I only lived in Porquis for about the first 6 or 7 years of my life but they were the best. My best friend at the time was Randy Tremblay and i would love to here from him again. Enjoyed many years of my youth in Porquis Jct. Many memories of playing for the Porquis Barons hockey team. Non of that indoor rinks hockey, good old outdoor rinks. Being able to go into the shack to get your fingers and toes warmed up by the wood stove and enjoying a hot chocolate to warm your insides. Sad to hear that they took down the train station, my father was the station agent there for many years. Too much of our history is being torn down, soon there will be nothing for our children and grandchildren to experience as we did. Porquis was a big part of my life. My dad owned the Canada Hotel a place where everyone met after work for a cold beer . Life was simple then , friends were friends and recreation was free. Its sad to return and see the sadness of a lost town . The stations are no longer there and the hotel is just a memory.I was there recently for my Uncles funeral and saw a lot of old faces but none familiar . I guess we have all aged. Time moves on but Porquis is etched in my heart…..
would love to receive copies of any old pictures you would have from this area so that |I may put on the Porquis site. Our museum also has a scanner that can make pictures from old negatives. I spent the first 18 years of my life growing up in Porquis Jct. It was the best – we had three corner stores – one still stands today. To the best of my knowledge this one was originally owned by the Doxie family. The other two were owned by the Manzuk and Frank families. We also had four churches – United, Catholic, Anglican, and Jehovah Witness. The United Church is the only one that remains standing and has been converted into a house. The others have been torn down. We attended Porquis Public School from grades 1 to 8. This was a 4 classroom school and the principal at that time was Mr. Bill Glembus. For high school we had to travel to Iroquois Falls – 6 miles away. The Canada House was also a thriving business in the 60′s/70′s – the local hotel was owned by Joe Tremblay. The Porquis RR Station was also a busy place where travelers rode by rail to other parts of Ontario – this building has also been torn down. Enjoyed your write ups on other towns in that area….hope to see more. Hi would you be related to Patrick T. Cashmore & Emily Owen? I’m doing family tree research and your last name caught my eye. Saw your post to my sister Debbie from 2014. Did she reply? We are grandchildren of Patrick and Emily. Who are you? I have a pretty good family tree on the Cashmores and some on the Owens. Hope you get this; I am very interested in knowing about your family tree research (especially since your name is Ashley – a family name!